Proposals to sell off some English forests are not a "done deal", Environment Secretary Caroline Spelman has told the BBC. She also denied the plans had already been axed, saying the consultation was still in its early stages. Proposals to offload 258,000 hectares run by the Forestry Commission have attracted cross-party criticism and public protest. Mrs Spelman said "wild speculation" had caused much of the concern. The government has outlined options for the future ownership of the public forest estate over the next 10 years. 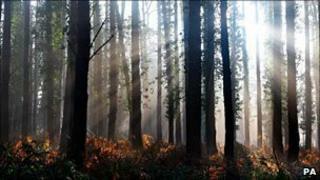 Proposals include inviting charities to take on the ownership of "heritage forests", helping community groups buy or lease forests and a £250m sale of leaseholds for commercially valuable forests to timber companies. But government sources have told the BBC's Politics Show that the controversial proposals are about to be substantially watered down, or dropped altogether. Asked whether the government was about to ditch the plan, Mrs Spelman told the programme the previous Labour government had considered selling off some forests to private investors - and argued that the government was trying to improve protection and public access to forests. She blamed "wildly inaccurate" speculation for much of the opposition to the plans and encouraged critics to read "the real McCoy" - the consultation document. Asked if the proposals were still on the table, she said: "Absolutely, we are in week two of a 12-week consultation process, right at the beginning of the consultation process and I think we've managed to bust a few myths that we aren't about to sell off the forests or restrict access - quite the reverse." She added: "Unlike some of the consultations we saw in the past, like the Post Office closures, where you knew it was a done deal, this is genuinely open and we want people to get involved with this consultation because it's about greater local accountability and some greener solutions." She said headlines such as one suggesting parts of the New Forest could become a golf course were to blame for much of the uproar. Asked if she was pulling back from the proposals, Mrs Spelman told the programme: "No, not at all. I'm trying to make the point there has been a huge amount of speculation about what our proposals actually are." Separately her department has denied any U-turn on the sale of National Nature Reserves. The Sunday Times reported that it had been planning to dispose of 140 National Nature Reserves - including the Lizard in Cornwall and Lindisfarne in Northumberland - but they would now remain in public ownership. But the Department for Environment, Food and Rural Affairs said: "This is not a U-turn. There is no consultation paper on the ownership of the National Nature Reserves, and there will not be. "Officials and Natural England have been scoping a range of options as you would expect but ministers have decided that the National Nature Reserves will remain in public ownership." A public consultation on the future of England's publicly owned forests has begun and a bill to enable the sale is due to go before the House of Lords. Officials at the Department for the Environment, Food and Rural Affairs have stressed that no commission-owned land will be sold off if appropriate guarantees over public access cannot be reached. Labour has described the plans as "environmental vandalism" and in a debate last week the Conservative MPs Julian Lewis - MP for New Forest East - and Guy Opperman, MP for Hexham in Northumberland, were among those raising concerns.